The New International Reader’s Version has simplified verses, such as Matthew 13:15 above, for developing English readers. By the 1990s, the New International Version was the bestselling English translation of the Bible. But developing English readers had difficulty with the NIV’s longer words and sentences. Was there a way to make the text more comprehensible for these people without sacrificing the merits of the translation? In the spring of 1992, the International Bible Society voted to begin a simplification project to meet the needs of these developing English readers. 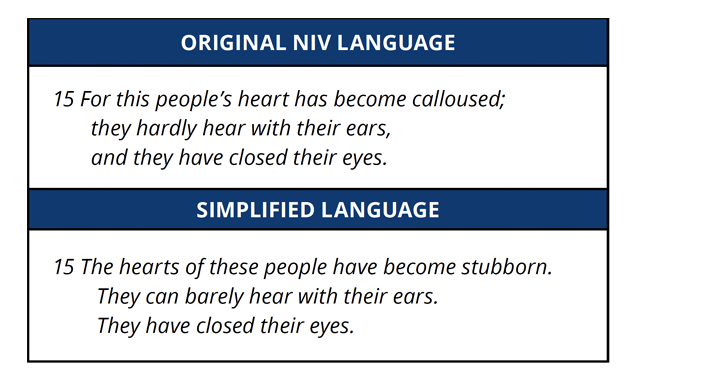 Led by Ron Youngblood, a member of the Committee on Bible Translation (CBT), 40 translators and English-language experts from 14 denominations worked to bring the reading level of the NIV from about an eighth-grade level down to a third-grade level. The participants, including several contributors to the initial NIV translation, consulted the original Greek, Hebrew and Aramaic and kept the text of the NIV whenever possible. When they finished, each chapter was evaluated for sentence and word length, grade level and reading ease, and the accuracy of the text as determined by Bible scholars. In the fall of 1996, the full text of the New International Reader’s Version, or NIrV, was ready. Children and other developing English readers could now more easily read the Scriptures by themselves and follow the readings in church. Today, the NIrV is one of the top-selling English-language Bibles. It continues to help developing readers engage not only with the biblical text but also with the God behind it.